Electronic Arts is asking the United States to cancel five trademarks held by Tim Langdell's Edge Games, saying the marks have been effectively abandoned. In comments to Kotaku, EA portrayed its actions as done on behalf of the development community. Langdell, at the center of many controversies over the years regarding trademark rights to the word "Edge", has been involved in a similar dispute with Electronic Arts since 2007 concerning its title "Mirror's Edge." 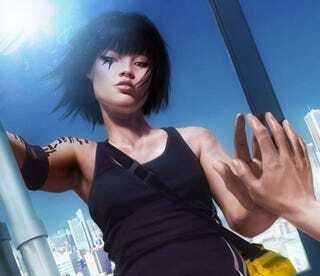 On Sept. 11, EA filed a petition with the Trademark Trial and Appeal Board of the U.S. Patent and Trademark Office to wipe out five trademarks involved in the case, saying they have been threatened by Langdell for a year over the distribution of Mirror's Edge. "EA has filed a complaint to put an end to legal threats over a trademark issue related to our game, Mirror's Edge," company spokesman Jeff Brown said Tuesday. "While this seems like a small issue for EA, we think that filing the complaint is the right thing to do for the developer community." Langdell, in a statement to Kotaku, called Electronic Arts' petition "a desperate attempt by EA to see if they can win the right to use Mirror's Edge by forcibly removing Edge's legitimate rights to Edge." Langdell pointed to a USPTO ruling in his favor, from August 2008, which found EA's registration of the trademark "Mirror's Edge" had been granted in error, and the company's subsequent abandonment of the mark - made official Sept. 8 - "stands as an acceptance of Edge's rights." The USPTO database does list the trademark "Mirror's Edge" as "abandoned" as of Sept. 8, 2009. When asked about the timing of EA's filing, Brown, the spokesman, said only that the company had been unsuccessful in its yearlong attempt to resolve the dispute, and "we feel it is important to establish the rights of developers in this situation. So we filed the petition to cancel those marks." Brown also declined to comment when asked if the petition was at all related to any upcoming product announcements using the word "Edge." Nor would he specify how negotiations with Langdell broke down. Over the years, Langdell has been accused of heavy-handed behavior against developers who wittingly or unwittingly use the word "Edge", which he trademarked years ago for use in video games, and a slew of other associated products since then. In addition to the disagreement with EA, Langdell has been involved in a bitter dispute with Mobigame, whose iPhone game EDGE has appeared on the iTunes App Store and was later removed when he challenged Mobigame's usage of the title. The notoriety surrounding this action in large part led to a campaign to have Langdell removed from the board of directors of the International Game Developers Association. Langdell voluntarily quit the board last month rather than face a removal vote. "A lot of small developers who are faced with this situation settle claims because they don't know how, or can't afford to fight for their rights," said Brown, the EA spokesman. "We hope that as a result of this action, other developers will be less intimidated by unwarranted legal threats." But Langdell counters that EA is trying to poison sentiment against his company, and that its accusations "sound like comments intended to sway indie game news reporters' opinion and deflect you away from the obvious fact that it is EA [that] indie developers need to be protected from." In the filing, Electronic Arts alleges that Langdell has effectively abandoned these trademarks through disuse. While Langdell vigorously states his company is actively involved in the development of games, both Mobygames and this analysis say the last game published by Edge Games was in 1990. Edge Games' Web site says it is developing four multiplatform titles, one of which "Racers," was released on Sept. 9. "Clearly, Edge has not abandoned its trademark and that allegation is obviously destined to fail," Langdell told Kotaku. Langdell's statement says Edge's games "are on general sale at this time as they have been at all times over the past many years." Significantly, EA also alleges that Langdell fraudulently obtained the trademark registrations, filing out-of-date and even falsified specimens to obtain them. EA alleges two registrations, dated 1996 and 2006, used box covers from games published in 1989 and 1990 and were not examples of a mark used in commerce, especially as the 1990 game was developed for the since-discontinued Commodore Amiga. Another 2009 registration submitted an Edge mark used on the 1986 game Bobby Bearing, saying that game had been in use "continuously over the past five years," on mobile phones. EA claims that is false. Langdell flatly denied that Edge ever committed fraud in applying for its U.S. trademarks. Langdell has also said that Mobigame told him, in an email published here, that it and Electronic Arts had formed some sort of partnership, to what end he did not say. In a lengthy public statement published last August, Langdeel seems to imply that EA and Mobigame might be working together "to seek to undermine our rights in EDGE," to get out of an agreement Langdell says Edge and EA had reached earlier. Brown, the EA spokesman, said that to his knowledge EA has no formal relationship with Mobigame. A request for comment left with Mobigame was not answered as of publication time. Mobigame replied to Kotaku that, in May, it had been working on a video game project unrelated to EDGE, or any game involved in this dispute, licensed by a British company that was in negotiations with Electronic Arts to publish it. Those negotiations have since ended, Mobigame's David Papazian said. According to a notice sent by the USPTO, Langdell has until Oct. 27 to respond to EA's petition. Should the matter proceed to trial, that will begin in the summer of 2010. Electronic Arts' filing may be downloaded here, in .pdf form. Langdell, for his part, accuses EA of playing the bully in this matter. "The key dispute for the past two to three years ... has always been between the multinational conglomerate EA and Edge fighting for its rights as a relatively small indie developer up against the giant corporate bully, EA," Langdell wrote. "It is a great pity that another fellow indie developer, Mobigame, got caught in the crossfire, but at least EA are now out in the open with their fight, now openly trying to stifle the legitimate rights of indie developers."